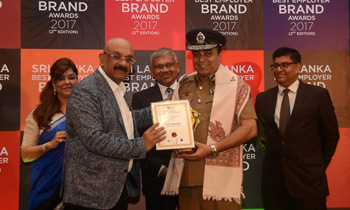 IGP Pujith Jayasundara received the award for Sri Lanka’s Best Employer Brand Award - a lifetime achievement award - at the World HRD Congress - 2017 held at the Hotel Taj Samudra in Colombo today. 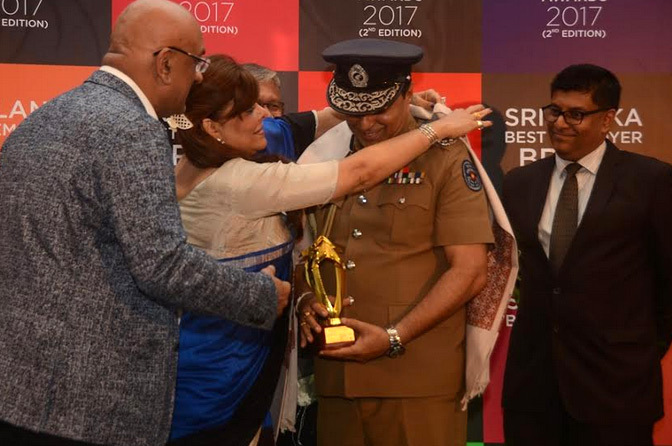 The World HRD Congress hosted the award ceremony in recognition of the top organizations and individuals from Sri Lanka who are exemplary in Human Resource Sector. It is a global event that encompass all crucial elements of HR, including Strategic Human Resource Management (HRM), Training and Development, Learning, Coaching, Leadership, Organisational Development, Design-Thinking and HR Tech. Now. The JO has something new to shout about. Hope it'll divert its attention from saitm. Today is not April 01st. but this sounds very much like a joke. We have the best finance minister,and the best police officer. Very soon there will be awards for the best P.M. and the Worlds best President.By next year awards for the best ministers to follow. I think that some foreigners are taking our people for a beautyful ride. @dilip, I totally agree with your comment .Very soon only our country will be the heaven in the world because we are the BEST nation in every occasion. This is a new racket by NGO - easy money can be earned via inflated Invoices - common here. The next can be Best Parlimaentarian!!!!! Is it because "yes sir, yes sir...."
He is the man to appreciate.The barrier is politicians. Congratulations Sir, This gentleman really deserves this award. A true employer and a hard worker from the beginning. The lift operator too should be given a part of this award! no wonder why JO was against him from the start. They should also honour the Environment minister for solving the world's notorious garbage problem without stink! Mr IGP, Don't be overwhelmed by this award. They will call you tomorrow to supply police uniforms from Coimbatore Cotton Mills. Ravi had to quit the ministry after getting a similar award. Do these NGOs do this in other countries? Or are they taking advantage of a free holiday in the process in 2017Tourist Destination chice? He was bending the law a lot and he got this award.